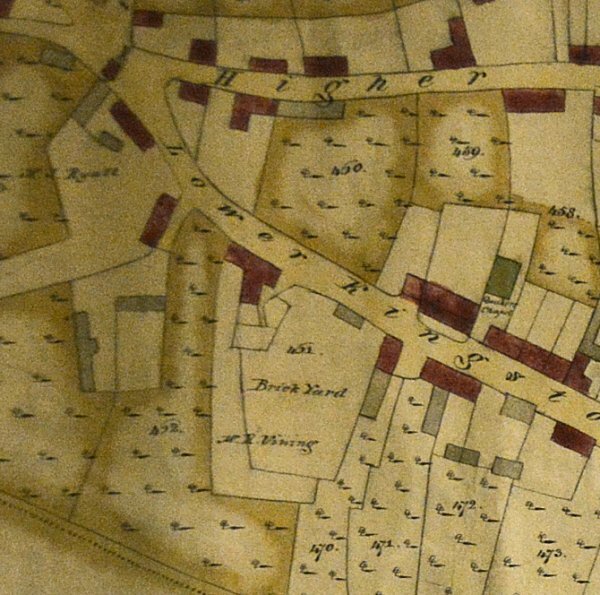 Kingston House (not to be confused with Kingston Manor House) in Kingston was built around 1830 (certainly before 1831) in the Regency style by mason and master builder Charles Vining on land that had previously been the brick yard of his father Richard (see first map below). Kingston House became the home of Charles Vining's wealthy solicitor son James Tally Vining at least from 1842. Charles Vining also built neighbouring Swallowcliffe House, for wealthy glove manufacturer George Mayo, around the same time. In the 1841 census James Tally Vining, a solicitor in partnership with John Slade of Penn House in the firm of Slade & Vining of Church Street, was living in Kingston House with a clerk and two female servants. After his marriage in 1847, solicitor Thomas Lyon bought Kingston House. 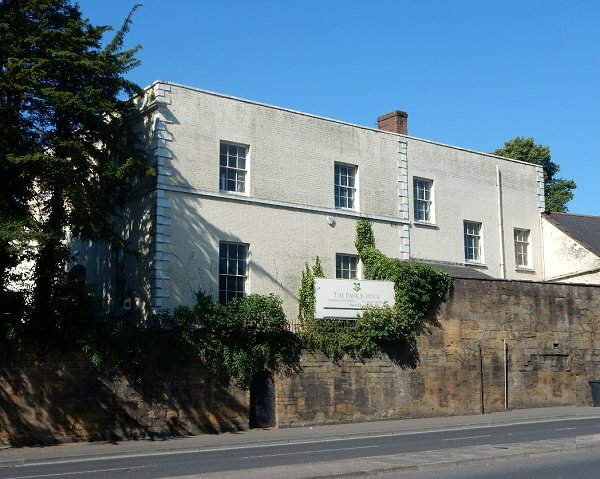 Kingston House became the home of mayor and wealthy glove manufacturer William Bide and his family probably in the mid-1850s, following his marriage, until his death in 1864. In the 1861 census William Bide and his wife Emma, both aged 52, were living in Kingston House with a cook, groom, housemaid and footman. William described his occupation as "Glove Manufacturer and Common Brewer and Mayor, employing 120 men, 15 boys and 1000 women ". Following Bide's death Kingston House became the home of glove manufacturer Elias Whitby Jnr and his family, retired glove manufacturer, town councilor, also mayor of Yeovil and magistrate. Following Whitby's death in 1880, his widow Hannah remained in the house until her own death in 1888. 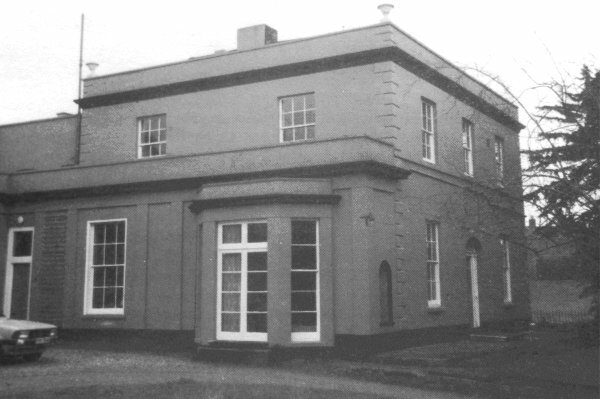 The next occupant was Dr Unwin but by 1907 it was the home of Captain Yates. Retired Executive Engineer of the India Public Works, Oswald Vavasour Yates (1855-1925), his wife Margaret, their three sons; Oswald StJohn Luttrell, Andrew Vavasour Scott and John Baldwyn, together with a governess, cook, parlourmaid, housemaid and scullery maid, all lived in the house. Kingston House became part of the Park School in 1935. Town House of c1840. Brick with Ham stone plinth, band and rusticated quoins: Welsh slated roof behind parapets with stone urns mounted on the four corners. The southeast entrance facade 2-storeys of 3-bays, with central 6-pane (4-glazed) door set in simple opening, with 12-pane sash windows each side: these shielded by wood and corrugated iron verandah across whole front, arcaded with bell hipped roof; at first floor level three 12-pane windows in simple openings, fitted with hinged venetian shutters. The southwestern return, rendered, matches the first floor in its 2-bays, but at ground floor level there is a single storey stone and rendered extension, with an angled bay window. 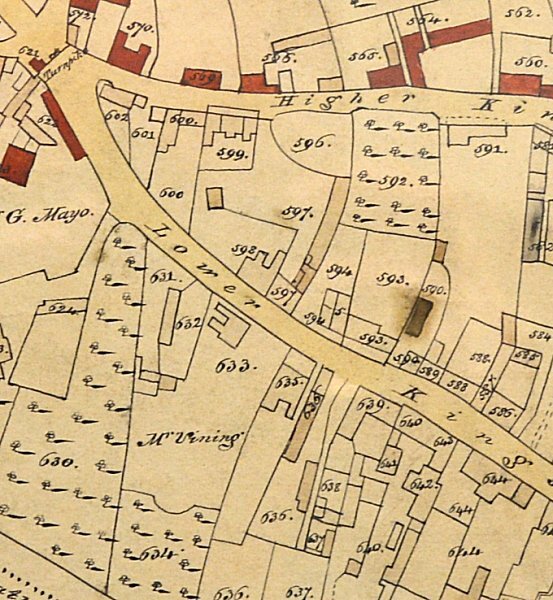 E Watts' map of 1806 showing Richard Vining's Brick Yard at lower centre that would become the site of Kingston House. The 1831 map of Yeovil showing Kingston House in its Parcel 633, lower left of centre. 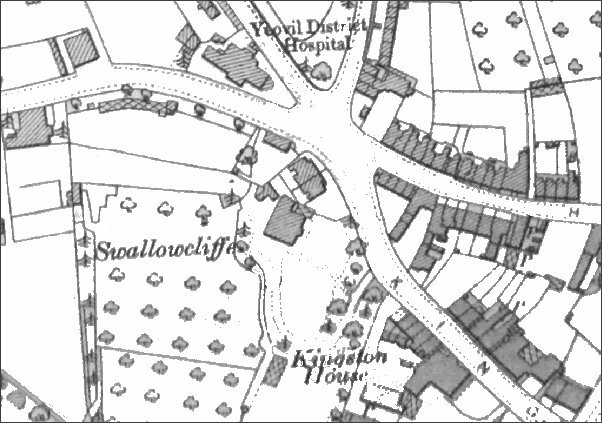 Map based on the 1901 Ordnance Survey, showing Kingston House at bottom right. This Regency house, Kingston House, was built by Charles Vining and was the home of his son James Tally Vining. It later became part of the Park School. Kingston House, now the Park School, seen from Reckleford. Photographed in 2016.